Need a player to provide the guiding hand and steer your team to victory; Puerto Rico’s Brianna Burgos would seem a more than reasonable choice. Partnering Chile’s Sofia Perez, she remained unbeaten as the duo claimed top place in their Cadet Girls’ Team first stage group at the 2017 El Salvador Junior and Cadet Open on Wednesday 16th August. A three-nil win was posted against the Costa Rica ‘B’ Team combination of Amanda Garro and Mariana Ugalde in their opening fixture of the day; in the concluding engagement the same margin of victory was recorded in opposition to the El Salvador ‘C’ Team partnership of Kenny Orellana and Sara Romero. However, it was against the El Salvador ‘B’ Team pairing of Lesley Gonzalez and Cristina Machado when Brianna Burgos shone. She beat both Cristina Machado (12-10, 7-11, 11-8, 11-9) and in the vital fifth match of the fixture Lesly Gonzalez (11-5, 11-9, 11-5) as a three matches to two victory was achieved. Sandwiched in between she partnered Sofia Perez to doubles success (11-8, 11-4, 11-9). Defeat but it was the only defeat of the day for El Salvador ‘B’. However, they were tested in their opening fixture of the day by their colleagues Kenny Orellana and Sara Romero of El Salvador ‘C’; a three-two victory margin was the outcome. Mainstay of the victory was Cristina Machado; she accounted for both Kenny Orellana (11-4, 13-11, 11-8) and in the decisive fifth match of the fixture Sara Romero (11-7, 7-11, 11-5, 11-3). The one further win for El Salvador ‘B’ was secured by Lesly Gonzalez; in the fourth match, she accounted for Kenny Orellana (6-11, 11-7, 11-9, 11-8). A place in the main draw for El Salvador ‘B’; it was the same for El Salvador ‘A’; the top seeds, the pairing of Monica Mendoza and Camilla Villalta finished in first place in their group, second position was secured by Mexico’s Monica Muñoz and Maria José Castillo. Meanwhile, in the one remaining group, the respective top two places were reserved by Puerto Rico’s Fabiola Diaz and Kassandra Maldonado; runners up spot was secured by Costa Rica’s Diana Piedra and Stacy Vega. 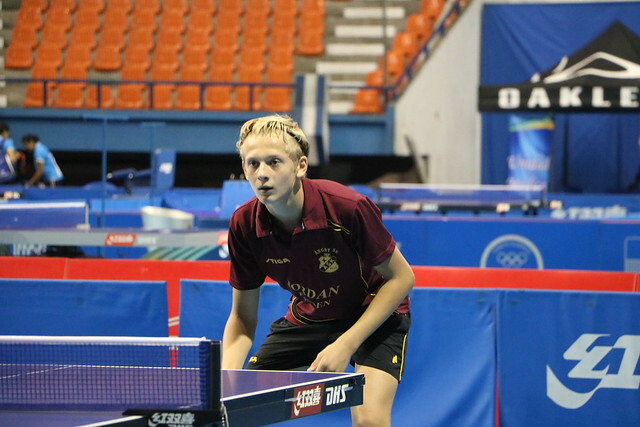 Teams finishing in first and second positions in each of the three groups advance to the main draw; the Cadet Girls’ Team event concludes on Thursday 17th August.